What`s going on in the city ? 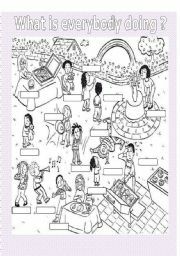 This is an activity to practice Present Continuous, Ss have a picture with a scene in the city and a set of cards that descrie each person so they match the number of the card with the person. 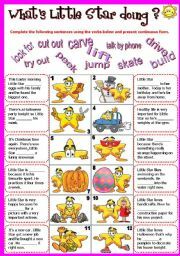 I have worked it as a worksheet and the picture and I cut the cards out. both ways have worked really nice for Students. Hope you like it!!! Students complete the spaces with the past of the verbs in bracket and then match them with the picture. 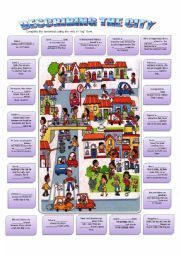 Describing the city - What are people doing ? I used this handout in order to work Present Continuous. 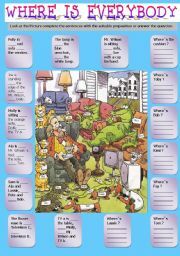 students look at the picture and complete the sentences with the suitable preposition or answer the question. (Mingle ACtivity) Find a person who... is a card activity where students have to practice personal information questions. They have to read some clues in a chart and complete find out who is person is. you�re going to find Cards I, Cards II and a chart with the clues for each card. What is little star doing? 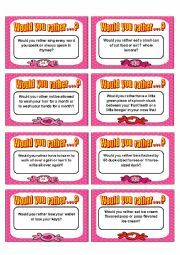 fill in the gaps with the given verbs using present continuous. 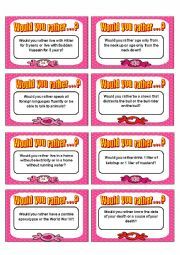 "Would you rather cards" I worked these cards with my studets i order to practice the use of "Would rather" with different kind of questions. They loved it! Students receive the worksheets and the set of cards so they read the clues which says what each person is doing so they write the name of each person. 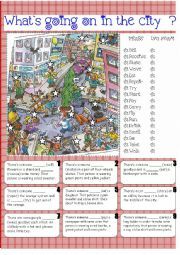 Students will read about a someone�s best friend, answer in oral and written way some questions. then they prepare a presentation about their very best friends.